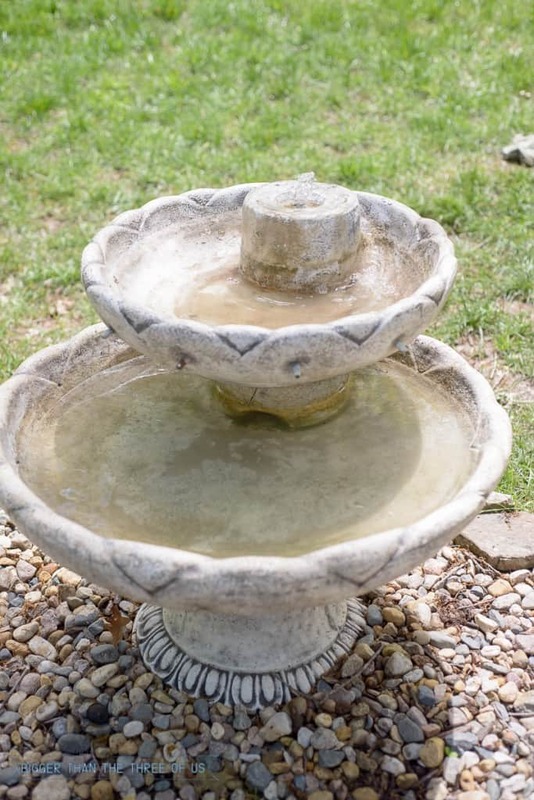 Today’s post, How to Run and Maintain an Outdoor Fountain, is another installment of how we are sprucing up our patio on a budget. Before you get started on this amazing post, make sure to check out the first post in this series about how we are going about the patio spruce-up. The intent of this series is just to document how we are making our space more functional and pretty without spending lots of money. I’d love to drop a few hundred dollars on new decor, cushions, plants and more but it’s just not in the cards for this year. So instead, I’m focusing on sprucing up a few areas for a small amount of money to help our space be enjoyable and pretty. Let’s get right into the post today, but fair warning… some of the fountain pictures are DISGUSTING and a bit embarrassing. No judgement, k?! It doesn’t look that bad, right? Think again, and look below. Yikes, right? So, we pulled the fountain tarp off a few weeks ago and it did an amazing job at protecting the fountain through the winter. BUT, things got piled on here and there and we didn’t get the fountain pumping soon enough. So, the debris and general disgustingness added up. This past weekend though, we went about fixing it. First things first, these types of fountains are beasts! They weigh a freakin’ ton. So, make sure you have someone to help you. Luke and I can barely lift the top piece together and the few times that we needed to get the bottom bowl off… we’ve had to have extra help. Dump the water out of the bowls first. If you can tilt the bowl, then let the water pour out that way. If you can’t tilt the bowl, then you can use a bucket and just scoop it out. Last year we used a suction pump with our hose and that worked as well. Just work with what you have. Next, use your free labor and tell them to get to work. A hard bristle brush and some soapy water will work wonders. For hard stains, we used some Simple Green. 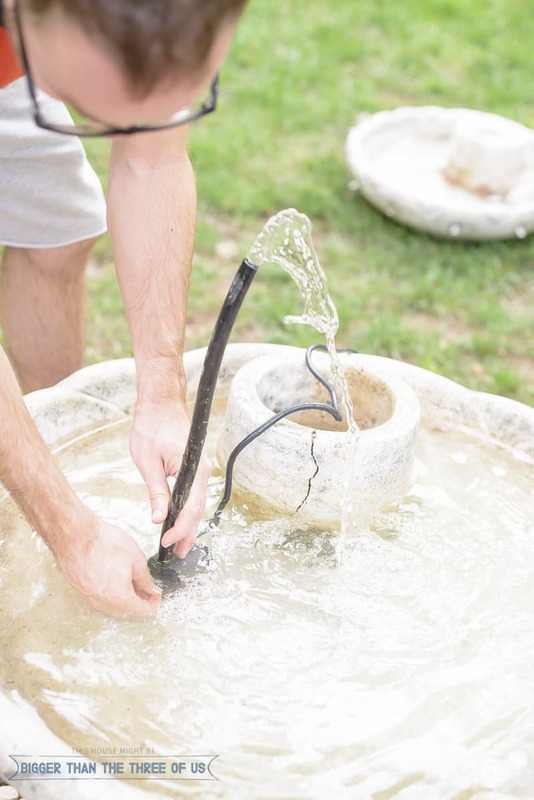 Before you winterize the fountain each year, make sure to pull your fountain pump OUT of the fountain. We’ve made this mistake and will not be making it again. There are lots of different types of fountain pumps. This one is submersible and electric. It has different levels for how high it pumps the water. 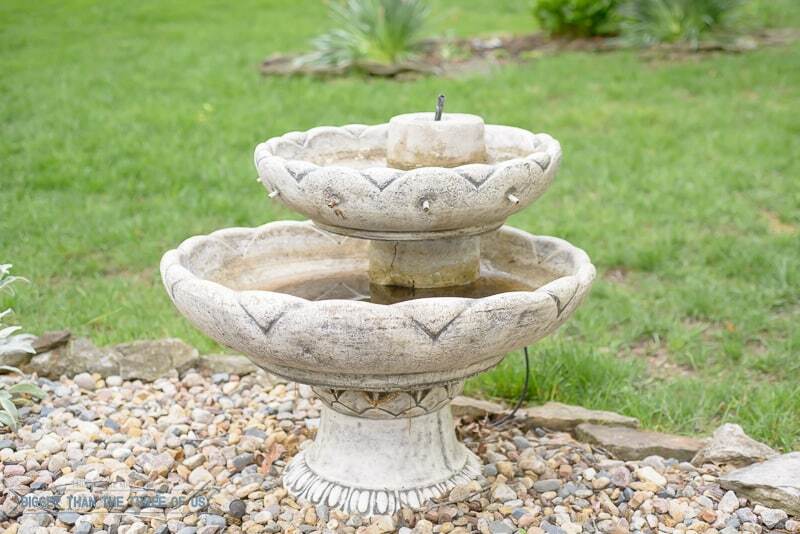 Make sure to really read the details on the pumps to determine which type you need for your fountain. Also, most pumps come without the hosing for the spout. Make sure to buy that while you are at it. 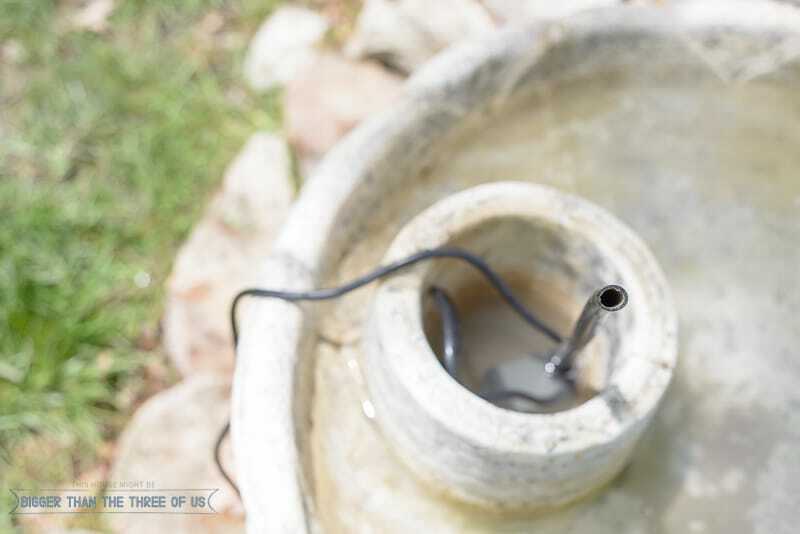 Once the pump was tested and we knew it worked, we put it inside our fountain. We placed the small bowl back on top of the big bowl and fed the hose up through the hole in the top. 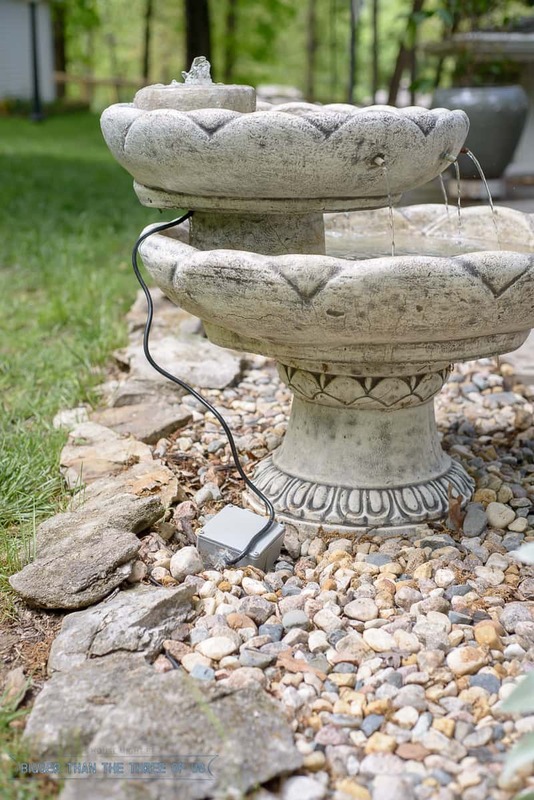 Our pump is electric (we get too much shade in our backyard to have a solar pump), so we have a cord that runs out the back to a box in the rocks below. The box holds the connection for the pump to the electrical line. From that box we have an electrical line (which we ran last year) that runs underneath our rock patio to an outdoor electrical outlet. The outlet has a timer on it so we can have the fountain come on just during the daytime. The water looks pretty clean, but we’ve found that, to keep it clean, you need to put cleaner in weekly. 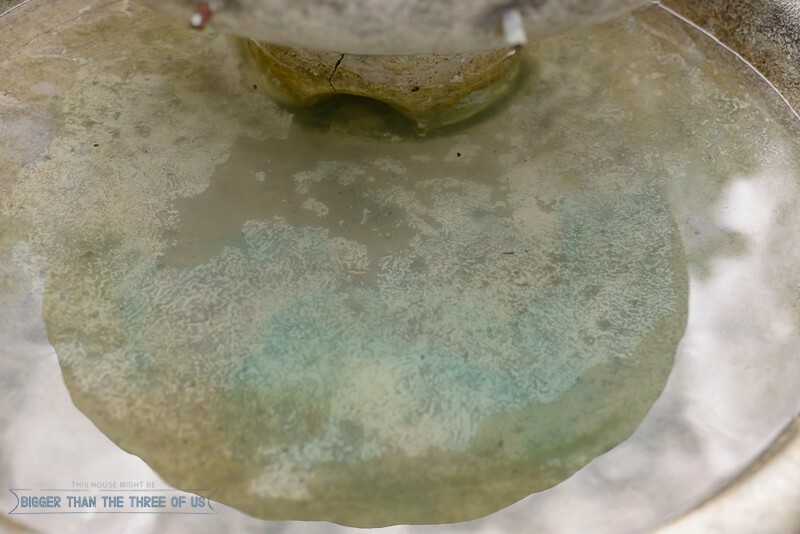 The cleaner comes out blue but dissolves. Sometimes our little waterfall holes get plugged, all we have to do is grab a small stick and poke out the junk that clogs it up. 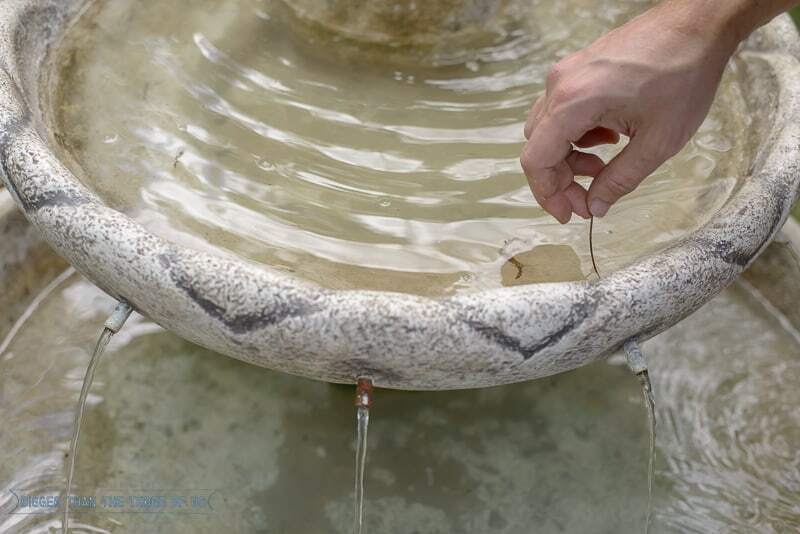 We’ve found that with just a little bit of maintenance and care, the fountain works great. 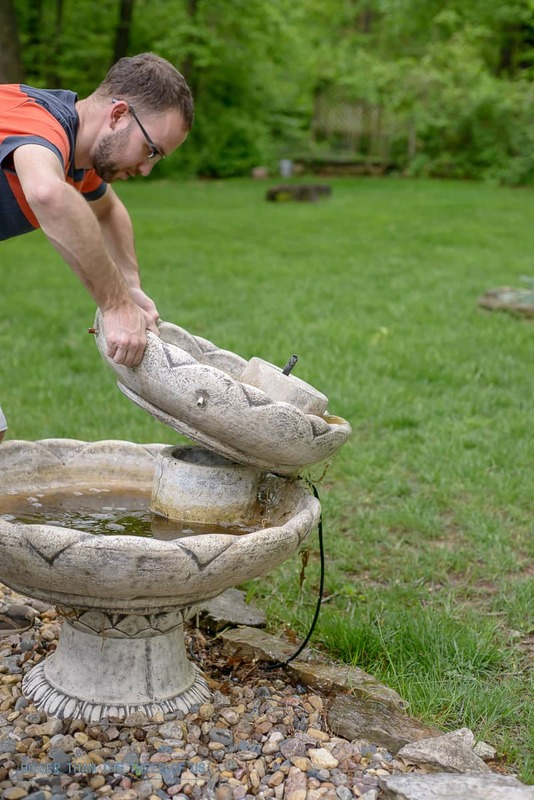 As with everything else in our house, we know that the fountain could even be a bit better. It has a crack on the “neck” and that crack has been there since we’ve moved in. Eventually, we need to fix that. Also, it did have a kissing couple on top as the decorative top piece. It could use a different decorative piece, but I’m in no hurry. I’m content to enjoy where we are at. 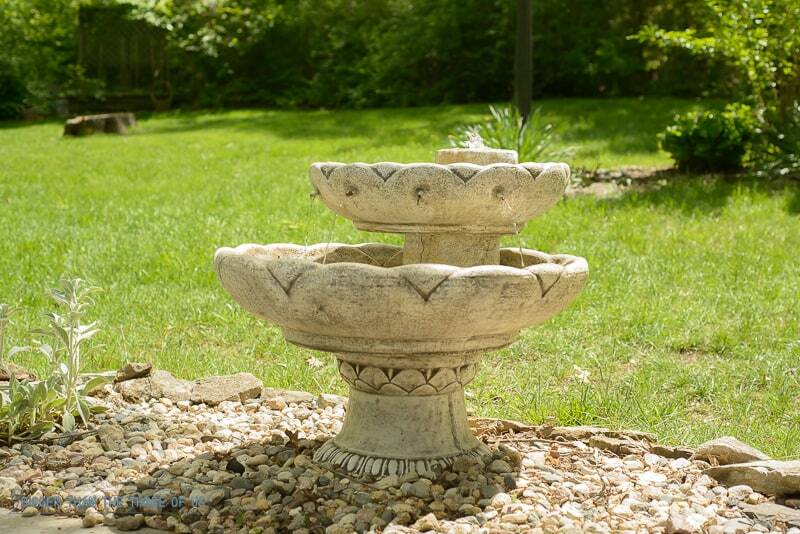 Winterize the fountain by taking the water out of it as well as the pump. 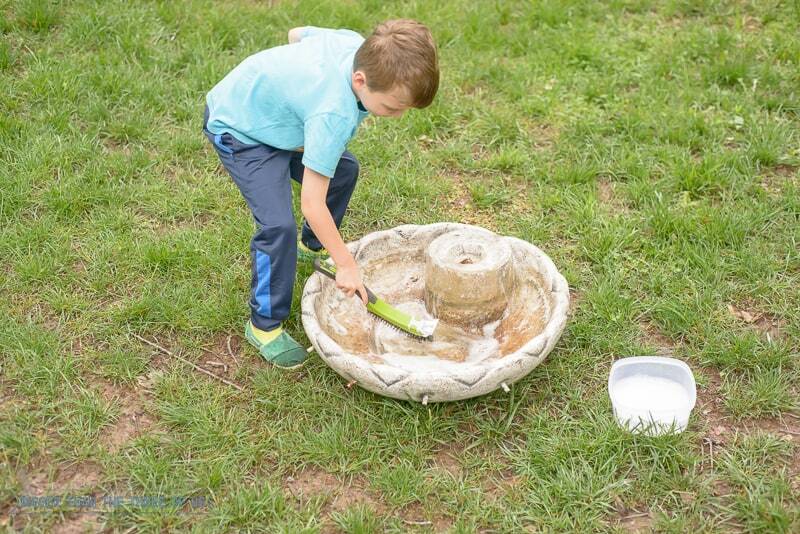 Put a weatherproof fountain cover over the top and, when it rains or snows, scoop the water off the fountain cover every so often. 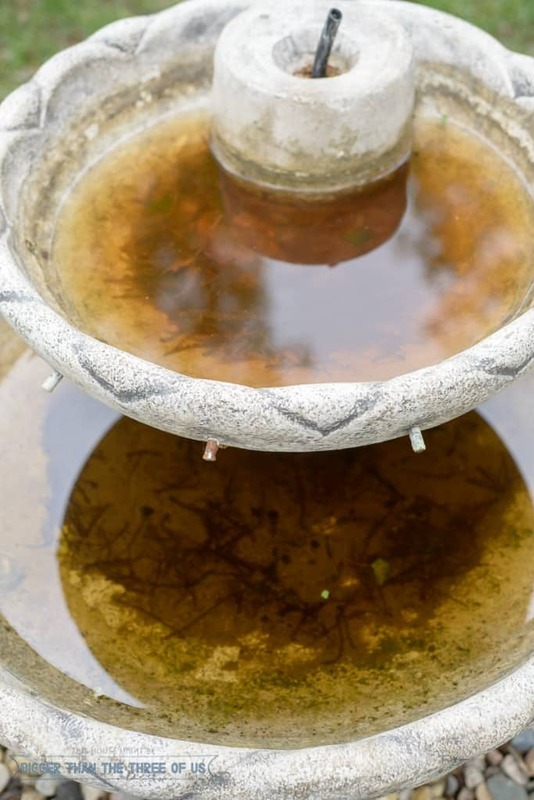 When you have the fountain in operation, use the fountain cleaner once a week to keep the water clear. If you want to play catch-up on more of the patio spruce-up series, check out the DIY Plywood Plant Stand on Wheels or Landscaping with Rock Instead of Mulch.